ProShuckers is partners with Shell Recycling Alliance and the Oyster Recovery Partnership (ORP). Here is how we participate. ProShuckers collects oyster shells from parties we cater and festivals. 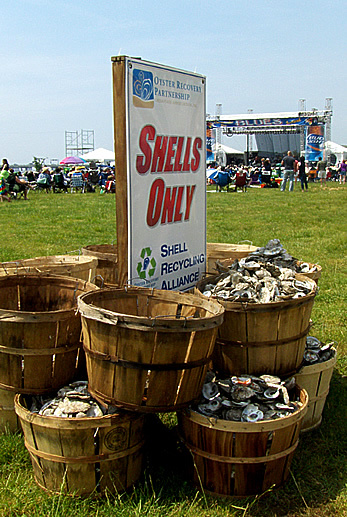 We put shells in ORP containers in Grasonville, MD. These shells are shipped to the University of Maryland Center at Horn Point Hatchery in Cambridge Maryland. After the shells are dried and cleaned, spat, baby oysters, are placed on shells. For more information about what ProShuckers can do for your next party, e-mail or call Steve at 443-520-0729. Copyright 2012-2019, Steve Curran, Pro-Shuckers., Annapolis, Maryland. All Rights Reserved. Website Design copyright 2012-2019 by Workable Web Solutions, LLC. All Rights Reserved.